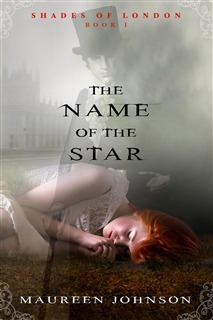 The Name of the Star is a good start to a young adult series that combines contemporary with paranormal. At the mention of Jack the Ripper in the blurb, I was hooked, as that topic in books or movies tends to interest me. I really had no idea what to expect from the story itself though, and I was pleasantly surprised. Johnson's writing is sparse and to the point with just the right amount of understated humor. I took me a bit to adjust to her style of writing, which has a very contemporary feel to it. I liked the story's main character, Rory, and the best part about Rory is her subtle sarcasm. She is an American who has recently moved to England and started at a high school in London. Wexford is very different from the high school Rory attended in Louisiana but Johnson does a good job of showing her acclimate to her new lifestyle. The best way I can describe Rory is to say that she is normal. She's not depressed, overly dramatic, conflicted, angst-ridden, or any of the other typical YA characteristics. She's just a normal teenage girl who is trying to orient herself to the ways of London. Learning about the world of London high school life was really interesting and since I follow Maureen Johnson on Twitter I know that she actually splits her time between England and the US so I know that her details are very authentic. Rory arrives at her new school on the same day that a Jack the Ripper copycat killer begins to reenact the 1888 murders. Readers who are new to the Jack the Ripper stories are provided with a good amount of history of the original killings, spread evenly and smartly throughout the story. The murderer kills victims who are similar in some way to the original victims, on the same dates, and in the same manner as Jack the Ripper. This would have been an intriguing plot on its own, but then Rory discovers that she can see ghosts, and that the Jack the Ripper copycat is most likely a ghost, and a whole other dimension is added to the story. Rory comes in contact with a secret, underground group of people who can also see ghosts and who patrol them and get rid of any who pose a threat to people. This is the one part of the story that underwhelmed me just a bit. I wanted a little more information about them and how they do what they do. I also felt like there wasn't enough of a dramatic feeling to some of their scenes and considering what their job is things should have felt a little more dire at times. I look forward to seeing more of these characters in the next book because I think they will become more fully fleshed out as the series continues. Since Rory didn't meet them until well into the story, they didn't really have enough time to become complete characters to me. I will definitely be checking out the rest of this series. Rory is a great protagonist and I enjoy the concept of this series. I'm anticipating the plot in the sequel, The Madness Underneath. Recommended for fans of: Jack the Ripper, books set in England, smart young adult protagonists, and ghosts. I'm definitely going to be checking this one out at some time. This is probably a weird question, but is the boarding school explained in a lot of detail? I really like books where the characters get to go away to boarding schools.